This PDF 1.5 document has been generated by Microsoft® Word 2013, and has been sent on pdf-archive.com on 22/07/2015 at 04:09, from IP address 66.194.x.x. The current document download page has been viewed 374 times. File size: 463 KB (34 pages). develop her interests in using the law as a tool to solve global justice issues. Threat to Environment, WASHINGTON POST, Jan. 21, 2005, at A04. B. What Sort of Formula Should Be Used to Yield Positive Results? these developing nations entered into this toxic and deadly horserace. States, one sees hyper and “digitally-addicted” consumers everywhere. PHILIPPINES NEWS AGENCY, Aug. 30, 2013, available at LexisNexis Advance. 3. See Eilperin, supra note 1.
obsolete products, these nations turn to developing nations for relief. 9. Siddharth Prakash, et al., Socio-economic assessment and feasibility study on sustainable ewaste management in Ghana, OKO-INSTITUT E.V. (2010), http://www.oeko.de/oekodoc/1057/2010105-en.pdf. women and children laborers that scavenge or mine for it. 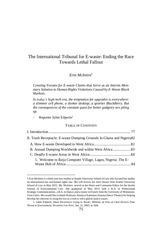 RACE, POVERTY &amp; THE ENVIRONMENT 1, 45 (2007), http://www.urbanhabitat.org/files/RPE141_Dayaneni-Shuman-s.pdf. Comprehensive Solutions, 41 ECONOMIC AND POLITICAL WEEKLY 2400 (2006). developing countries to suffer in the toxic wasteland once known as Earth. PERSPECTIVES, 4, A 148 (2012). 16. See Huo, supra note 14. 17. See Lubick, supra note 15; see Schmidt supra note 13; see Huo supra note 14. 18. See generally Huo, supra note 14.
to the natural environment. This has primarily been used for producers of these products, not nations. and the need for more permanent e-waste management systems. due to polluted food, water, and soil. harms that recycle back on to American consumers. the history of colonialism and its progressive fallout after World War II. 22. See Schmidt, supra note 13, at A 234. Growing Digital Wasteland, 18.1 U.C. DAVIS J. INT’L L. &amp; POL’Y 225, 239 (2011). 27. See Huo, supra note 14, at 1113.
quality electronics with a decent life expectancy. 32. See Huo, supra note 14; see Dayaneni, supra note 10, at 45. 33. See Chen, supra note 8, at 431. 34. See Ogunseitan, supra note 31, at 670. This file has been shared by a user of PDF Archive. Document ID: 00289227.